LKAB Norge AS, the biggest iron ore supplier in Europe, invests into a new loading facility at the port of Narvik in Norway. Being deep enough for ocean going vessels and ice-free all year round, this is the biggest export harbor site for the Swedish mining company LKAB in the northern part of Norway with a capacity of almost 20 million tonnes of iron ore/pellets per annum, arriving by rail from LKAB Kiruna in Sweden. LKAB’s inquiry called for a new linear shiploader, to be installed on a new pier in the harbor of LKAB, but to be identical with the main dimensions of the existing shiploader, so that a second shiploader of the same design could be installed later on the old pier as well. The shiploader designed by ThyssenKrupp reaches a loading capacity of 11,000tph (tonnes per hour) for iron ore and 9,000tph for pellets. The main dimensions are a maximum length of 144 metres from pivot point to loading chute in extended position and a maximum height of approximately 50 metres. 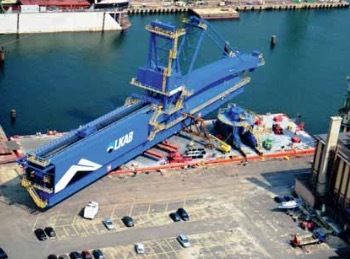 The shiploader is designed to load ships with a size from 5,000dwt to 180,000dwt and has itself a dead weight of approximately 1,700 tonnes. The shiploader has a special design with the rear side supported on a fixed point on land and the front side supported on a travel gear on the pier. The main beam is equipped with a driving shuttle and a liftable discharge boom. In order to observe the environmental requirements regarding noise and dust, the shiploader is provided with a covered boom and a discharge chute, which directly fills into the hatches, avoiding leakage of material and reducing the dust. The shiploader can be controlled via the computerized operator’s panel in the operator’s cabin or via remote control from the ship’s deck. A modern drive control and PLC system has also been incorporated. Because of the large shiploader dimension and lack of space on the new pier and surrounding area, the erection and installation of the machine at Narvik site was not suitable. Therefore, the decision was taken to assemble the machine at the harbour site in Gdynia, Poland, including commissioning of all drive arrangements. After completion of erection and commissioning, the whole shiploader was loaded onto a barge and shipped to Narvik. The loading procedure in Gdynia is scheduled for end of July 2015 and arrival in Narvik for the second half of August 2015. The loading of the shiploader and the two supporting travel gears onto the barge in Gdynia will be made with Self-Propelled Modular Transporters (SPMTs). These place the shiploader on the barge exactly in the same position, which is required at Narvik for unloading. behind the pier into the required final position for unloading and installation and will lower the shiploader onto the supports at land side travel gear and jetty travel gear.